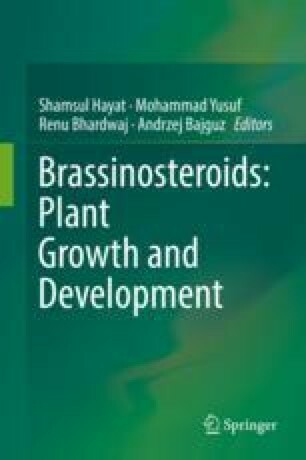 Brassinosteroids (BRs) is a naturally occurring phytohormone of steroidal nature, which take part in the regulation of growth and development of plants through their life cycle. In the present era, availability of a larger number of biotic and abiotic factors restrict the gross production of principal crops. Handful of literature revealed that BRs play vital role in modulating the plant response to various abiotic stresses through alteration in the activities of antioxidant enzymes and proline metabolism by inducing expression of genes involved in defense and antioxidant responses in plants. This plant steroid also found to be very successful in mitigating the damage caused by the oxidative stress under varied unfavorable environmental conditions. These days most debatable part in the BRs research field is the molecular mechanisms associated with the enhanced activities of antioxidant enzymes and proline accumulation in plants under various developmental and environmental cues. Here, we will shed lights on the action mechanisms by which BRs enhanced the activities of antioxidant enzymes and proline accumulation under both stress and stress-free conditions and cross talk with other plant hormones. Therefore, understanding the physiological, biochemical and molecular aspects of BRs would help in developing abiotic stress tolerance in plants in a more significant manner. MY is very grateful to Chair, Biology Department, College of Science, UAE University, Al Ain, UAE for providing all the necessary facilities to compile this chapter.